THE THAI MOVIE "FIRST FLIGHT"
View the trailer for "First Flight"
"FIRST FLIGHT," the Thai Feature Film, began production in 2002. The film had approximately 3 different scripts, 5 different directors, 4 different producers, and 3 different titles. The poster for "First Flight" appeared at Cannes Film Festival for three consecutive years previous to May 2007, when the film finally premiered under the title "Rak Siam Tao Fah" (Love Siam as much as the sky). The completion of "First Flight" was a labor of love. This was the first Thai movie to use real aerials in the production of a film. Three scale models of the Breguet 14 were built and filmed against a blue screen to later be inserted in the aerials. The computer graphic team had never flown before; they were taken flying and given the controls of the plane, so that they could feel the movements that they would need to create with computer graphics. The film chronicles a remarkable period in Thai history when the first aircraft arrived in the Kingdom. Much of Southeast Asia was being colonized at the time by Britain (Burma, Malaysia), France (Laos, Vietnam, Cambodia), and Holland (Indonesia). When King Rama VI made the bold decision to support France in WWI with expeditionary forces and pilots from Siam, he preserved Siam's independence after the war. The film depicts a classical era in early Siam with a young farmer boy that has a dream to fly. It would be impossible for him to ever fly, but there is a Thai proverb "fan hai glei, pai hai teung" which means as far as you dream, you can go. Lieutenant Colonel Luang Kaj Yuthakarn is the founder of the aviation program. He invites his former instructor and flying ace Pierre Pupong from France to help him. Duong is a poor farmer with a dream, and the beautiful Malai makes it all that more interesting. It is a story of a meeting of two different cultures and how each adapts to the other, and in the end, it is a story of pride and remembering the early pioneering aviators in the Kingdom of Siam. 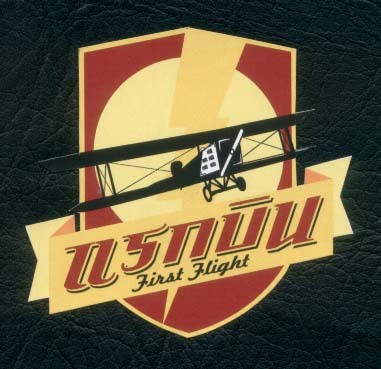 "First Flight" premiered in Thailand on 31 January 2008 -- List of Film Credits. The Société d’ Aviation d’ Extrème Orient, formed by Karl Offer, organized a flying demonstration by Belgian aviator, Charles van Den Born, in a Henri Farman IV biplane named “Wanda,” from January 31 to February 6, 1911, at Sra Pathum Racecourse (presently the Royal Bangkok Sports Club). Extra demonstration was added on February 9, 1911, due to public demand. In December 1913, the Ministry of War established the Aviation Section under the command of Field Marshal Prince Kamphaengphet Akhrayothin, Inspector General of the Royal Engineers at Sra Pathum Racecourse. The Aviation Section started with only eight aircraft and three pilots who served as mechanics as well. The three pilots conducted the first flying demonstration at Sra Pathum Racecourse, December 29 -30, 1913. On January 13, 1914, His Majesty King Vajiravudh presided over a demonstration flight. The three pilots had an audience with the King and proceeded to throw popped rice and flowers as a mark of honour and prosperity. His Majesty conferred upon Lieutenant Colonel Luang Sakdi Sanlayawut the Dushdi Mala Medal. This day has become National Aviation Day. The Aviation Section was moved from a small and swampy Sra Pathum Racecourse to a higher ground area at Don Muang. The move to the new site began on March 5, 1915 and three days later, on March 8,1915, the three pilots touched down their airplanes on the newly constructed airfield at Don Muang for the first time. The move was completed on March 17, 1915 and the Aviation Section resumed operations at its new home. On March 27, 1915, the Aviation Section was organized as the Army Flying Corps. The Royal Thai Air Force celebrates this date as “ Air Force Memorial Day.” On May 24,1915, less than two months after the establishment of the Army Flying Corps, Lieutenant Colonel Phra Chalermakas successfully made the first flight – test in a Breguet Type III at an altitude of 300 feet. The airplane was built from local materials (except the engine) by the Engineering Section, with a performance equal to the purchased aircraft. This fulfilled the determination of Phra Chalermakas to “build our own airplanes. The long journey of RS Production making "First Flight"